For all the knocks Madison Avenue gets for exploiting people's personal data to target them, industry executives by and large believe consumers should have sublime control over when, where, how and why their data is used to target them with advertising, content and other media. Those are the findings of a survey of industry executives -- both advertisers and agencies -- fielded by Advertiser Perceptions in October. The findings indicate industry executives are aligned with consumers, based on findings of a similar poll of consumers that Research Intelligencer conducted with Pollfish around the same time. 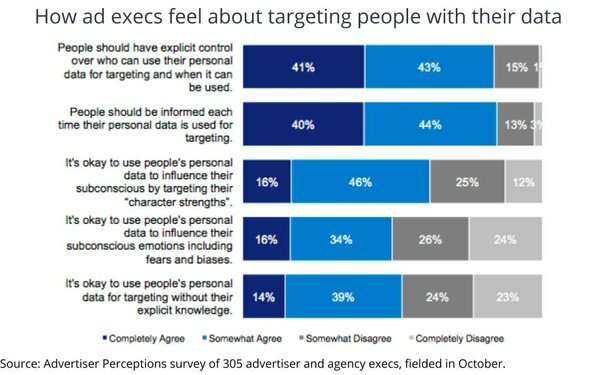 Eighty-four percent of executives agree that people should be informed each time their personal data is used to target them, and the same percentage agree consumers should have explicit control over who can use their personal data to target them and when it can be used. Industry executives and consumers are less aligned when it comes to the appropriateness of using people's data to influence them using their subconscious emotions, including fears and biases. Half of industry executives indicated it is okay to do that. Research Intelligencer will report on consumer perspectives in tomorrow's edition.